Once upon a time I thought that my girls would (both!) certainly be sleeping through the night after the first year of Isabelle’s life. Now she’s 2 years old and is still waking up in the middle of the night at least once. And if she (by some miracle) sleeps through, Clara wakes up because of a nightmare or to go potty or for something. And it isn’t for lack of trying on our part! In retrospect, I wish we would have sleep-trained Isabelle more seriously about a year ago, but we were dealing with Clara’s more-serious sleep issues then so we didn’t have the energy… it’s all been a mess. + This noise machine that was recommended by a sleep consultant. Evidently looping sounds aren’t great for babies brains, so fan noises are the way to go! + This turtle night light that creates star constellations on the ceiling. This is hit or miss for our girls, but they were really into it for a while! Now they’ve kind of lost interest, but it is a fun alternative to a night light. + An earlier bedtime is always an attempt – but sometimes it works better than others. Our ideal scenario would be that the girls start winding down around 6:30pm so they can be in bed by 7 or 7:30pm, but everything seems to get thrown off by social activities or Tim’s work schedule. It’s a lot of work to get dinner on the table by 5:30pm and I just don’t have it in me most days. Still, I can definitely see how an earlier bedtime is probably necessary for all of us. + A shared room. While this may seem counter-intuitive, I really do think it helps the girls to have a ‘buddy’ in their room with them. Clara, in particular, has been staying in her bed rather than coming to find us, since she doesn’t get ‘lonely’ in the middle of the night. + Speaking of which… we’ve also started bribing Clara to stay in her room until her ready-to-wake clock turns green. It’s amazing what the idea of some ice cream can do for her motivation! + Stricter naptimes. I was so great last summer about being on a very strict sleep schedule for the girls. But here’s the thing – I am not a scheduled person! So schedules and routines are SO HARD for me. This spring/summer I’m trying really hard to get back into a schedule, especially with naps. My goal is to have Isabelle asleep at 12:30pm every day and bedtime at 7:30pm every night. So far nothing has become miraculously easier, but I’m going to keep trying! It’s really hard to be consistent because our lives just generally not consistent! All of these things have helped, but we don’t have a miracle cure just yet! 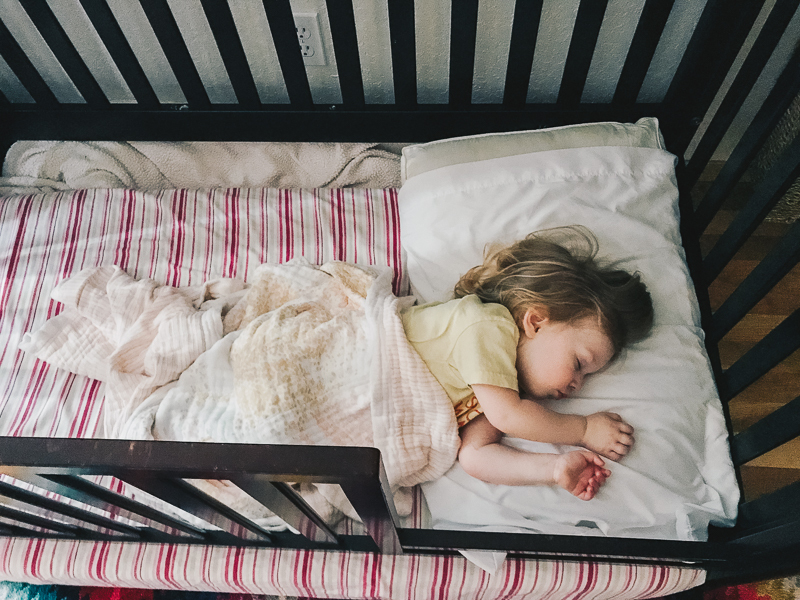 I’m hoping that if we keep the girls on a consistent schedule that things will get easier, especially as Isabelle gets older, but I’m just not that optimistic at this point… everything was going great until we switched Isabelle into a toddler bed, and now it’s all gone to crap! Plus with the summer coming up and the sunshine lasting until 10pm, it’s getting harder and harder to get the girls to wind down at 7pm. Wish us luck, though! And of course, I’m all ears if you have a miracle cure for toddler sleep! This entry was posted in motherhood and tagged motherhood, sleep, toddler. Bookmark the permalink. 2 Responses to Another post about (toddler) sleep. Oof, as a human who looove sleep it’s hard to imagine anyone resisting it- but I know such is the mindset of toddlers 😉 Although they’re dogs not children, my dogs sleep SO MUCH BETTER when they spend time outside, too. Best of luck!! Glad you’re finding some things that work!